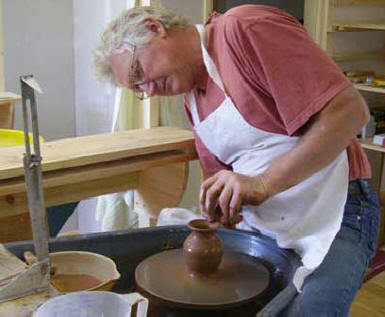 Nestling deep in the Teifi valley, Nantyfelin Pottery is run by Jamie & Dodie Herschel. Here we are able to enjoy the peace and beauty Mid Wales has to offer. A truly inspiring location in which to work. But if you are making a special journey to see us, please ring to make sure we are open as we sometimes need to be at exhibitions during the season. Please see the Workshops page for more information on lessons and workshops for visitors.